Location: South Pacific Coast, Costa Rica. Grid Reference: Costa Rica. 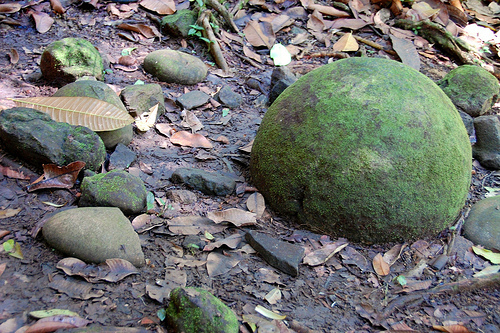 The Costa Rica Stone Balls: (Stone Petrospheres). Described by Columbus as the 'Rich Coast'. Over 300 of the carved stone balls have so far been discovered. The stones are believed to have been carved between 200 BC and 1500 AD. However the only method available for dating the carved stones is stratigraphy, and most stones are no longer in their original locations. They spheres range in size from a few centimetres to over 2 metres (6.6 ft) in diameter, and weigh up to 16 short tons (15 t). (1) Most are sculpted from gabbro, the coarse-grained equivalent of basalt. There are a dozen or so made from shell-rich limestone, and another dozen made from a sandstone. Photo: Archaeologist Samuel Lothrop pictured with his wife Eleanor during their investigation of sites in the Disquis Delta in 1948. Background: Dr. Stone (1943), Verneau and Rivet (1912-1922) and others discussed the distribution of stone balls, large and small, throughout the New World. They concluded that the spheres served different functions in different areas. Large examples outside the delta area are rare. Isolated specimens up to 3 feet in diameter are known from Olmec sites in Vera Cruz Mexico. They have also been reported at Zaculeu in the Guatemalan Highlands (largest 15 1/2 inches in diameter), occurring in the first level of occupation in what is regarded as Early Classic Maya. (3) It is noted in this respect that there are no 'stone-heads' in Costa Rica, of which there are several in Mexican Olmec sites, so the two cultures were likely unrelated. Context: There are only a handful of petrospheres still in their original settings, so we have little context within which to place them. A program is underway to try and replace or at least recognise more of the original locations for the balls, many of which were recorded by Doris Stone. Small (10 and 24 inches) stone balls have been found individually in burial mounds and in at least 2 instances, balls were placed in graves indicating individual ownership. Sometimes balls occurred singly, other times in groups. The largest group known to Lothrup contained at least 45 balls. Depressions in which balls previously stood could still be detected at the time. Some spheres were buried. Another interesting aspect of some balls, was that a small number had residual lime coatings, suggesting they might have been used as beacons in the forest (3). Reports say that they were often found in groups of three, in the shape of a triangle, and always placed in the North-South direction. The layout of the stones above was recorded by S.K. Lothrop. Spheres E and F are now in the Museo Nacional in San Jose, Costa Rica. Making the Balls: The rock-source for the Costa Rica balls is both from far and near. There is a local Limestone called Coquina, located near the mouth of the Diquis River which was used to make some of the smaller spheres. Even though it is relatively close, it was still transported several miles. The larger spheres have an igneous granite rock source, of which the croppings come from across rugged terrain over 50 miles away high up in the Talamanca Mountains. Archaeologist Doris Z. 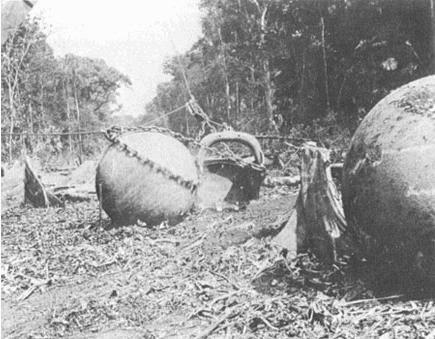 Stone photographed these round stones being shifted during jungle clearing to make way for railway tracks that would service the United Fruit Company banana plantations (Photo: 1943). 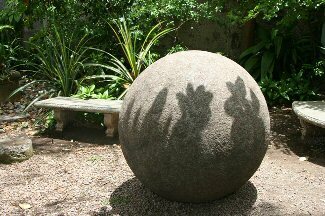 At this time then, very little can be said to be known about the origin or purpose of the Costa Rica stone balls. There is no question that they were manmade, and each would have required huge investments in both time and labour to transport and shape. While it is most likely that they served as a symbols of ritual or status, their artistic merit is not to be ignored. The simplicity of these vastly sized spherical stones on the landscape is both pleasing to the eye comforting in its contrast to a natural background. Perhaps this in itself was the reason for their existence. "The balls have been endangered since the moment of their discovery. Many have been destroyed, dynamited by treasure hunters or cracked and broken by agricultural activities. At the time of a major study undertaken in the 1950s, fifty balls were recorded as being in situ. Today, only a handful are known to be in their original locations". "The earliest reports of the stones come from the late 19th century, but they weren't really reported scientifically until the 1930s — so they're a relatively recent discovery," Hoopes said. "They remained unknown until the United Fruit Company began clearing land for banana plantations in southern Costa Rica." "We date the spheres by pottery styles and radiocarbon dates associated with archaeological deposits found with the stone spheres," Hoopes said. "One of the problems with this methodology is that it tells you the latest use of the sphere but it doesn't tell you when it was made. These objects can be used for centuries and are still sitting where they are after a thousand years. So it's very difficult to say exactly when they were made." "We think the main technique that was used was pecking and grinding and hammering with stones," said Hoopes. "There are some spheres that have been found that still have the marks of the blows on them from hammer stones. We think that that's how they were formed, by hammering on big rocks and sculpting them into a spherical shape." Gallery of Images: The Costa Rica Petrospheres. Musee National du Costa Rica. Above Right: Isla Del Cana. Other stone spheres have been reported to have been found in Bosnia, West Mexico, Easter Island, Scotland, United States (Joshua Tree National Park), central Serbia and Japan (Nishijima Islet, Hypogo Pref. And at Yamazoe village, Nara Pref). 1). 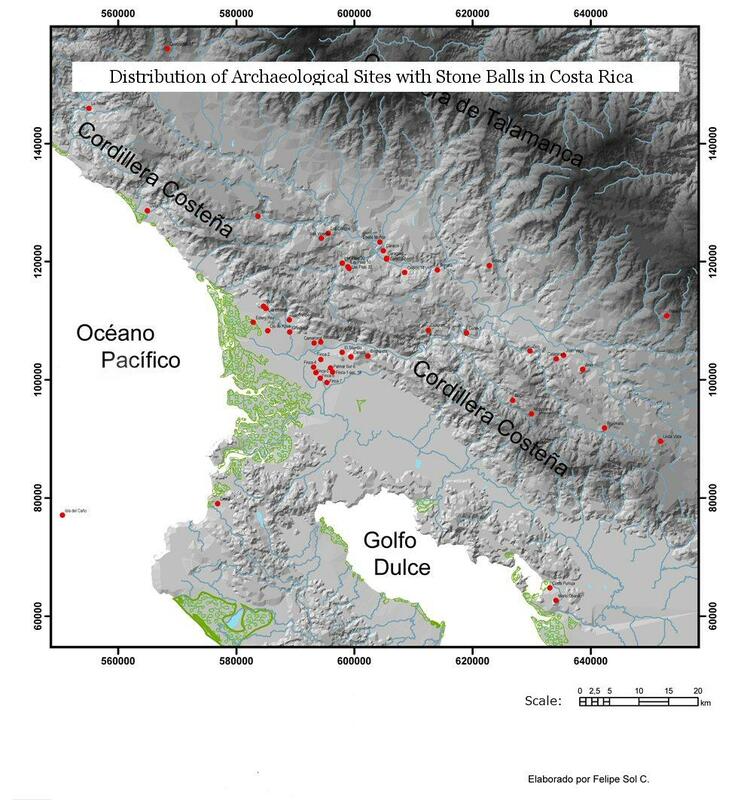 "The stone spheres of Costa Rica". BBC News. 29 March 2010. http://news.bbc.co.uk/1/hi/sci/tech/8593717.stm.